The Attorney-General’s Chambers (A-G) or the prosecution has acted with urgency to quell the growing public anger after a “Datin” escaped a jail sentence for abusing and assaulting an Indonesian. The prosecution worked swiftly to appeal against the good behaviour bond imposed by the Petaling Jaya Sessions Court and the High Court today (March 29) revised the sentence to eight years’ jail for Datin Rozita Mohamad Ali. “I wish to congratulate the prosecution for giving the case urgency to reaffirm public confidence in the judicial system. The eight-year jail sentence is most appropriate to serve justice,” Gerakan Deputy Speaker Syed Abdul Razak Alsagoff said. “However, the case has not seen a closure. The Datin is appealing against the jail sentence with the Federal Court. “Until then, Malaysians will continue to monitor the progress of this highly public interest case of maid abuse and assault,” he added. Indonesian maid Suyanti Sutrinsowas was found bleeding and unconscious beside a drain in Mutiara Damansara on December 21, 2016 … she suffered multiple injuries to her eyes, both her legs, her hands and internal organs. She also had a broken scapula, injuries to her right lung, a blood clot near her brain and a fracture to her cheek. Syed Razak, who is Gerakan’s nominee to contest N.37 Bukit Lanjan in the coming 14th General Election (GE14), said Malaysians would be hoping that the Datin’s appeal “will fail”. “She may even get an enhanced sentence, who knows. The eight-year jail sentence serves as a reminder and warning to employers not to abuse or beat up their maids like slaves or animals. “We also hope the jail sentence serves as a deterrent to employers who have the tendency to abuse and beat up their maids,” he added. 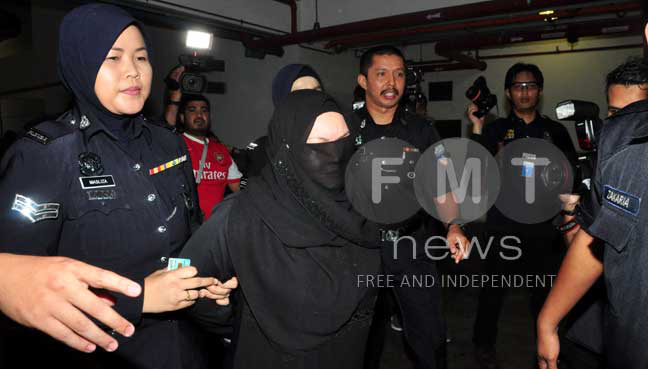 SHAH ALAM: The Datin who sparked outrage after she was released on a good behaviour bond for abusing her maid was jailed eight years by the High Court today. Judicial commissioner Tun Majid Tun Hamzah, in allowing the review of deputy public prosecutor Iskandar Ahmad, ruled that the good behaviour bond imposed by the Petaling Jaya Sessions Court earlier this month was incorrect. “I am of the view that the lower court has wrongly exercised its discretion in imposing the bond. “This court’s order does not reflect the seriousness of this offence,” he said. The High Court also said the Sessions Court had wrongly considered the fact that Indonesian maid Suyanti Sutrinso had withdrawn her police report during the trial as a mitigating factor before imposing the bond. “Once a police report was lodged, it was no longer her case. It is now the state’s case. “And it is up to the attorney-general to pursue the case against the alleged perpetrator if he finds there is sufficient evidence for the complaint,” Tun Majid said. The court added that Suyanti had been employed as a domestic worker, not a slave. Tun Majid ordered Rozita to serve her jail sentence from today, and refused an application for stay of execution by her lawyer Haniff Khatri Abdulla. Haniff said they had been instructed to appeal against the jail sentence. Rozita, 44, was bound over for five years on a bond of RM20,000 by the Petaling Jaya Sessions Court after she changed her plea and pleaded guilty to causing grievous hurt to Suyanti. A video of Suyanti seriously injured and lying near a drain in a housing area in Mutiara Damansara had gone viral in December 2016. It was reported then that Rozita had allegedly used a kitchen knife, a clothes hanger, a steel mop and an umbrella to cause multiple injuries to Suyanti’s head, hands, legs and internal organs. An online petition against the court’s sentence attracted over 70,000 signatures."